Here at FullCodePress, the 24 hours are overâ€”each of the sites are finished, the clients and teams are taking a well-earned rest. Now, it’s time for the judges to cast their careful eyes over each site. Let’s take a sneak peek inside the judging. 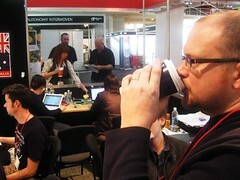 We’re hidden away in the media room here at CeBIT, having spoken to the clients and the teams. Just like each team, we’ve had just 24 hours to get to know the clients, their needs, and their expectations for the sites. Now that the sites are done, it’s our task to assess each site on a number of key criteria. Markup: Judged by yours truly. I’ll be checking to ensure that the markup on the site is semantically appropriate, sensibly named, structured cleanly, and of course valid. Being from a content management background, I’m also interested in whether each site’s CMS helps users keep the resulting markup clean and tidy, and encourages good habits among the users. I’ve seen many a good site ruined in the past by the fact that a CMS does a poor job of cleaning up someone’s code boo-boos, or worse yet, introduces validation errors of their own. Accessibility: Gian Wild, a renowned accessibility ninja, will be assessing each site on its access strengths. Since the Aussie team is working with a disability advocacy group, this is especially important for this team–but with Rainbow Youth’s requirement for an open and inclusive site, we can be sure she’ll be holding the Code Blacks up to the same exacting standards! Design: Assessed by Andrew Larkin of Adobe, who’ll be looking for how the sites’ respective designs matched the clients’ briefs. Innovation and Mobile Devices: Lachlan Hunt of Opera will be assessing each site on its use of innovative technologies and their suitability for mobile platforms. If you’ve been keeping an eye on proceedings with HTML5, you might recognise Lachlan’s name from the HTML5 Working Group. So what’s innovation? “I’m looking for creative use of new technologies,” says Lachlan, “such as CSS3, microformats, any new DOM APIs, use of the canvas element, perhaps, things that are supported in recent browsers along with graceful degradation in older browsers.” No team was game enough to try HTML5, so this wasn’t assessed, although some CSS3 has snuck into each site’s stylesheets. Content: Natasha Hall will be keeping her eye out for how well each team has managed to address the audience that’s expected to be the primary users of the site. Each client has a fairly broad variety of users, so it’s important that the content adequately serves all kinds of users. Whose site reigns supreme? Judging has just been completedâ€”we’ll be sure to keep you updated with the results as soon as they’re revealed.